Motorsport to Automotive is an exclusive series of events for MIA members only and is driven by the automotive OEM’s that recognise the value of the technologies created by innovative Motorsport R&D. 2018 marks the 70th Anniversary year of Lotus which was acquired by Geely Holding Group in September 2017. The Geely Group intend to leverage synergies across businesses to compete with Porsche through brand building and a diversified product offering. This will position the Lotus brand in its strongest ever position and has been evidenced by a double digit growth in worldwide sales. Lotus are well known for their strong R&D and its 100-acre facility in Hethel, Norfolk has its own 2.2 mile private test track. To mark its 70th anniversary they plan to launch two new cars – special editions of Elise and Exige models. As a recognised leader in high performance electric motors, Integral e-Drive has been continuously developing next generation technologies as part of the move towards a more sustainable way of powering vehicles. On our stand we will be showcasing a range of IPM and SPM electric motors used in a variety of applications from automotive to aerospace and from off-highway to the highest echelons of Motorsport which offer the highest power density in their field with un-paralleled performance and efficiency. Manufactured in our Milton Keynes Engineering Centre, we offer products that precisely match the client’s requirements by configuring our core technology to meet exacting performance and package requirements. 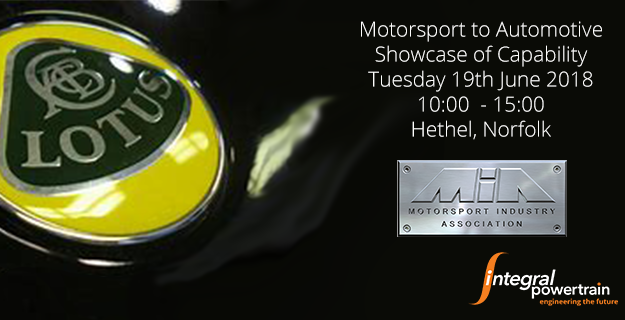 We would like to invite all interested engineers at Lotus to attend this event where a number of MIA members will be showcasing their engineering capabilities. If you have any questions or would like to schedule a meeting with us during the event, please do not hesitate to contact us.